One of my favorite activities is enjoying a vigorous walk with the local walking club. A Charleston-area woman who’s an avid walker had a genius idea when she organized an online walking Meetup group. It’s open to the public for a $5 annual membership fee. She hosts frequent walks, which are publicized to members via email and on the Meetup website. At each, fitness enthusiasts lace up their athletic shoes and do some power walking. The location of the walks vary, and they range from 3-10 miles. Since the weather is ideal for walking year-around in South Carolina and there are lots of scenic places to hike (including historic Charleston, beautiful neighborhoods and the nearby beach), the group is popular and has quite a few members. All you do is make a reservation online before the event, show up with a water bottle and follow the leader! Walkers often come alone, and the participants are always friendly. People form small groups and enjoy lively conversation, which makes the time pass quickly. (I’ve never gone to an event and not had a fun conversation with several nice people!) Before you know it, you’ve covered four miles! Sometimes participants get together for a soda or lunch after the hike, and many times they exchange information and get together outside the group. It’s an easy way to make new friends who are interested in fitness-related activities; many of the members are women aged 30-70, and a surprising number are women who just moved to town. 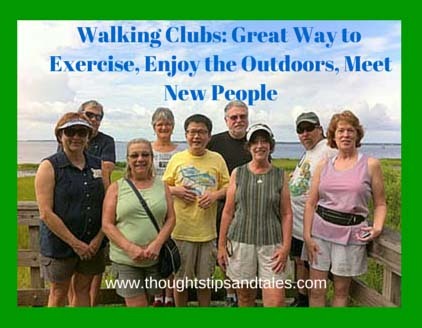 If no walking club exists near you, think about starting one! You can organize easily through Meetup and charge a small annual fee to cover the $19 monthly website and notification cost, or post a notice in the newspaper or on a bulletin board and do it the low-tech way. This entry was posted in hiking, meetup groups, walking, walking club and tagged fitness, meetup groups, power walking, walking, walking club, walking group. Bookmark the permalink.